Kensington is a great place to walk, shop and dine... and full of history. The first subdivision, Kensington Park, was mapped on April 8, 1910 and opened for the sale of lots on Thanksgiving Day, November 25, 1910. The Heart of Kensington is a group of neighbors who have come together to help preserve and promote our neighborhood's small town look and feel. We celebrate Kensington's uniqueness by conducting historic home tours and lectures, communicating information about our historical resources, and interacting with preservationists in other historic neighborhoods. Explore these pages and get a look at some of the great houses in Kensington that have been formally designated as historical resources. Check out the Walking Tour for the complete list of designated historical resources in our neighborhood. Find information about the process of historical designation, the Mills Act, and historic districts. Check out this interactive map that shows the location of all the historically designated resources in Kensington. Most of all, walk around Kensington and take in the beauty of the solidly constructed old houses, decorative lamp posts, sidewalk stamps, one hundred year old trees, and attractive business district. Find out where Kensington Park, Kensington Manor, Kensington Heights and Talmadge Park are. Learn about your neighborhood, meet your neighbors, and share your appreciation of this wonderful place we call home. To keep posted on the details for future Landmarked Homes of Kensington tour, visit this website frequently for updates, or send email to info@HeartofKensington.org. 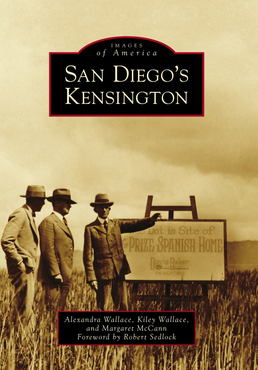 New book of historical photographs of Kensington now available! Available in local businesses and online at Amazon. 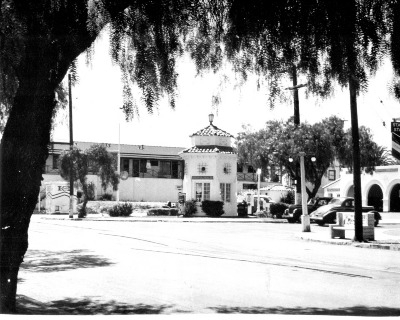 Northwest corner of Adams Avenue and Marlborough Drive, circa 1947.